The animation shows the journey of a girl through the forest to its interior. Irresistible force pulls her into the heart of the wilderness, to the lake hidden deep in the primeval forest. Her guide and mystical guardian is a moose. During the trip they meet the mysterious inhabitants of the forest, characters known from the European folklore. 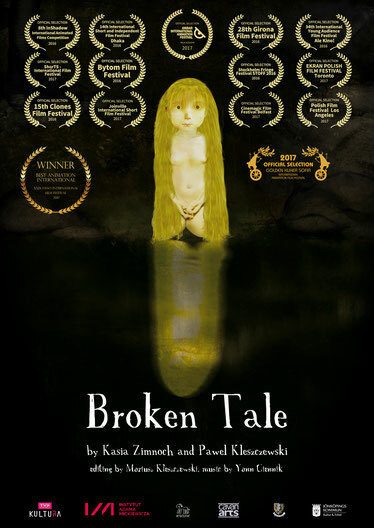 "Broken Tale" is a story about adolescence, passing through life, boundary situations, the life cycle of women. The story is based on the Swedish folk tale "Sagan om lilla älgtjuren Skutt oh prinsessan Tuvstarr". In the animation we refer to the motifs from Slavic, Celtic and Scandinavian folklore. Instytut Adama Mickiewicza przyznał animacji "Broken Tale" grant "Kultura Polska na Świecie" i nasz film zostanie pokazany na festiwalu InShadow Festival w Lizbonie 21-25 listopada. "Broken Tale" animation was awarded by Adam Mickiewicz Institute's grant "Polish Culture Around the World" and will be presented on InShadow Festival in Lisbon 21-25th November.